Welcome to What I Miss Most, a recurring column in which writers wax poetic about the things from home that they found themselves yearning for upon moving to NYC (or the things from NYC they craved upon moving away from it). For an archive of previous What I Miss Most columns, click here. On election night in 2008, I was in DC, working late at my first post-college “real” job editing press releases for run-of-the-mill government clients. With the race up in the air, I had prepped two different versions of the same release -- one that heralded in the historic event of an Obama presidency, and the other that glumly announced the dawn of an alternate universe where McCain & Palin won the White House. I stayed at the desk until the odds had mounted so convincingly in Obama’s favor that the higher-ups decided to call it a night, even while swing states like Virginia hung in the balance. 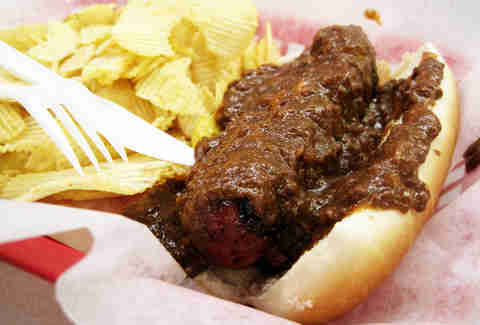 Straight from the office, I headed to Ben’s Chili Bowl. That night, I noticed the sheet had been hastily amended right up near the top. The ink was probably still drying, but the words were legible. “The Obama family,” they read. And that, more or less, is how I came to be sitting in one of the city’s most iconic black businesses, eating its most iconic food, at the very moment I found out that America would have its first black president. THEY EVENTUALLY PRINTED A NEW SIGN. | FLICKR/ANGELA N.
For the uninitiated who have never had the pleasure of experiencing a Ben’s half smoke or an election in the District firsthand, the significance of this moment may elude you. Allow me to elaborate. In a nutshell (er... sausage casing), half smokes are considerably larger than the average dog and charred distinctively on the sides. Ben’s then covers them with chili and cheese on top, and if you don’t order them with a side, serves them with potato chips salted to "imminent gout" levels. They also feature an unmistakable blend of cumin, garlic, and smoke that hits your mouth with the funked-out smoothness of a Chuck Brown bassline. At the climax of the Civil Rights Movement, Ben's became a cultural monument. Ben’s didn’t invent the half smoke, but it has damn near perfected the DC delicacy. And besides, the restaurant’s legacy extends far beyond cased meats. In the time of segregation, the U St corridor -- where Ben’s opened a half-century ago in the place of DC’s first silent movie theater, the Minnehaha -- was a bustling entertainment district colloquially known as “Black Broadway.” Certified G.O.A.T.s of the era like Nat King Cole, Miles Davis, and Duke Ellington would stop by Ben’s for half smokes on their way to or from gigs. 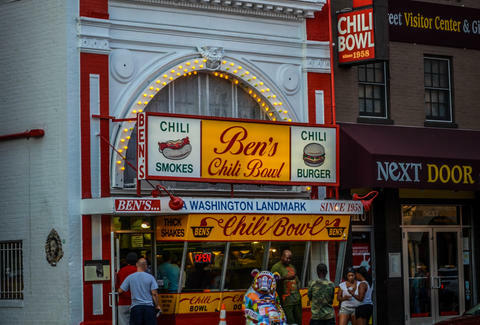 Ben’s Chili Bowl became a cultural monument in 1968, at the climax of the Civil Rights Movement. Unemployment rates for DC’s black population were well above the national average, the city was 67% black while its police force was 80% white. The city neared a breaking point. The DC riots that followed the assassination of Martin Luther King, Jr. left U St in shambles. By the time the dust settled, over a thousand buildings were destroyed. Ben’s stood strong through it all, obtaining permission from the city to stay open past curfew, and feeding first-responders, police, and black activists like Stokely Carmichael during the four-day fray. In a 2005 Bloomberg article, Ben Ali’s sons Kamal and Nizam recalled, “Dad had to soap up the window and write ‘Soul Brother’ in the soap to keep from being burned out.” The tactic worked, and the home of the half smoke survived. Forty years after the riots, it was election night 2008. Ben’s was popping with its usual mix of off-the-clock suits, neighborhood regulars who'd been coming longer than I’ve been alive, and of course, the ever-present peppering of tourists. Shortly after I saw the amendment to the “eat free” list, official word from CNN went out that Obama had clinched the presidency. I celebrated with a red plastic basket lined with wax paper, where a bed of greasy ruffled potato chips rested beneath two half-smoked sausages covered in chili and cheese. Ben's was a bulwark against growing gentrification in a time when DC still felt small. After eating, we headed to the street, where the city had transformed into something like the glorious, unpolished, lovingly cheesy “Yub Nub” ending of Return of the Jedi. The crowds had already edited the campaign's familiar chant ("yes we can") to the triumphal, definitive "yes we did!" People joyously banged on cars and buses as they passed; their drivers, just as happy, honked frenetically in approval. It was a surreal experience. The taste of beans, garlic, cumin, and charred half smokes will always evoke the magnanimity and goodwill I felt that night. These days, the District's food scene is rife with on-trend restaurants and big-time names from out of town. Hell, momofuku just opened there! It's starting to feel a bit like NYC, with its obsessive food hype, rapid restaurant turnover, and constant construction. Don't get me wrong -- I'll ride or die for any joint Erik Bruner-Yang opens (word to Maketto and Toki Underground). But in 2008, all that was in its infancy. That's what I really miss most: when DC still felt small. For decades, Ben's had been both a bulwark against growing gentrification and a testament to the power of community. That night felt like a celebration of all the things for which Ben's had stood and still does. Eating half smokes and watching a longtime dream materialize from inside the Washington landmark made us feel like anything was possible in our city. That night, the District’s 68.3 square miles felt downright huge. 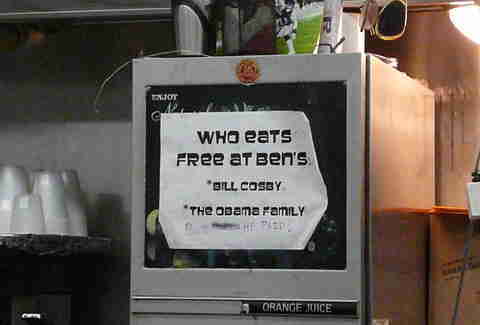 And for the record, Obama did end up going to Ben’s Chili Bowl before his 2009 inauguration. Despite the Ali family’s standing discount, he paid. Jian DeLeon is a writer & editor who lives and works in NYC. Follow him on Twitter.